The beloved host of the NBC hit show American Ninja Warrior draws inspiration from both the fierce competitors on his show and his own unlikely path to success to outline the essential steps to achieving your goals and becoming a modern-day ninja. Akbar Gbajabiamila, the host of NBC’s hit Emmy-nominated show, American Ninja Warrior, did not have an easy path to success. One of seven children by Nigerian immigrant parents, he grew up in the Crenshaw district of South Central Los Angeles during the 1980s and ’90s, a time when the neighborhood was fraught with riots and gang violence. With dreams of playing professional basketball, Gbajabiamila found success not in the sport he loved, but in football. Late in his high school career, Gbajabiamila suited up with pads for the first time and was thrown into the complex sport of football. He climbed major hurdles to play college football and then professional football. After playing in the NFL, it was only after years of hard work behind-the-scenes in radio and television that he was offered the job to be the host of American Ninja Warrior. 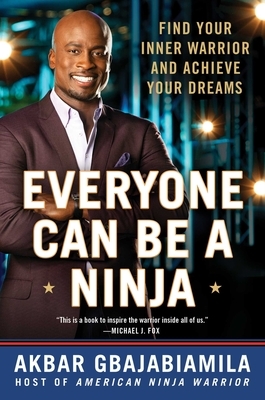 Through his own inspirational underdog stories and interviews with modern-day ninjas who have accomplished extraordinary things in their own lives against the odds, Akbar proves in Everyone Can Be a Ninja that it doesn’t matter if you make it through every step of the obstacle course on the first try. Ninjas keep pushing themselves until they reach their goals, and they don’t let anyone or anything stand in their way. It is easy to see greatness in others; it’s hard to see it in ourselves. Everyone Can Be a Ninja shows you that we can fulfill our potential and achieve our dreams by finding our inner warriors. Akbar Gbajabiamila is the host of NBC’s Emmy nominated, heart-racing obstacle course competition series American Ninja Warrior. He also hosts Universal Kids’s spin off show, American Ninja Warrior Junior as well as NFL Networks’ highest rated show NFL Fantasy Live. He is also NBC’s face of Red Nose Day 2018. He completed the Executive Certification Entrepreneurial Program from Wharton School of Business. He has appeared countless times on the TODAY show, Rachael Ray, Good Morning Football, Entertainment Tonight, Access Hollywood, Extra!, and more.